Chris loves automobiles and has maintained, repaired, and/or restored over a dozen of them in the last 15 years. These days, people are keeping their cars longer than ever before. In fact, according to the latest statistics from R.L. 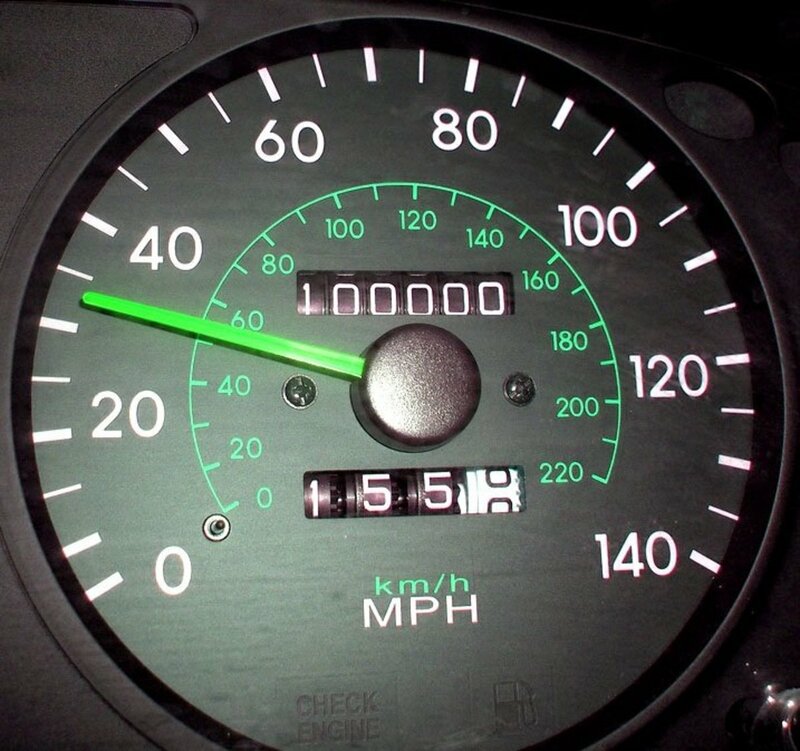 Polk Co, the average car on the road is now almost 11 years old. There are several reasons for this striking statistic. However, the most obvious reason is the fact that the economy took a nose dive in late 2008. So if you are like the millions of people electing to drive their cars beyond the 100,000 mile mark, it would be wise of you to invest the money into getting the proper maintenance needed at this integral moment in your car's life. Before diving into the biggest maintenance project of your vehicle's life, be sure to consult with the maintenance schedule for your vehicle. Since every vehicle is different, many items may or may not apply to your particular car or truck. If you have lost or manual or are otherwise in doubt, don't be afraid to read on or ask your local reputable auto shop for advice. 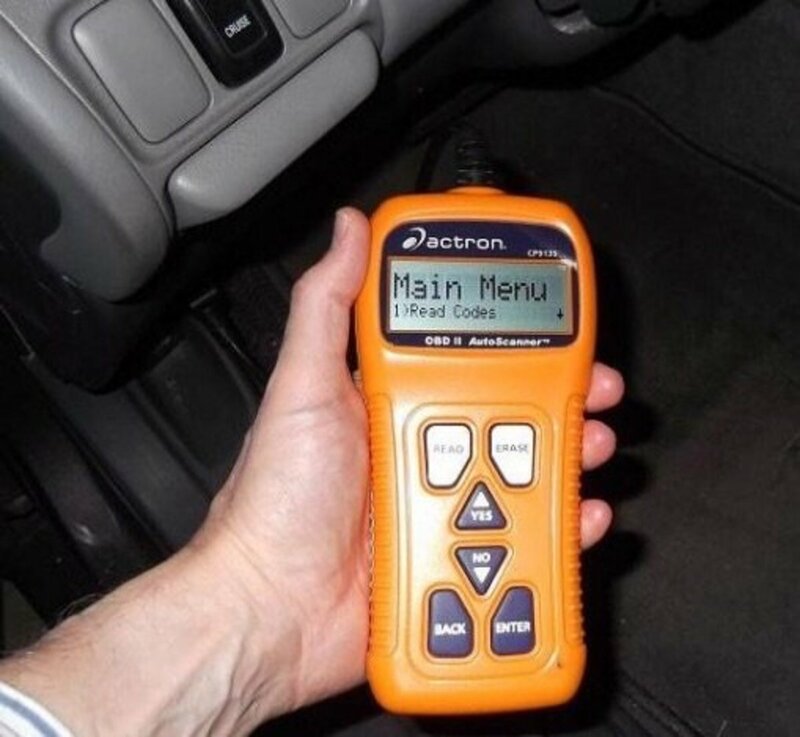 In addition, most auto manufacturers have made copies of the owner's manual available online. Below is a general guide to what a typical car may need maintained at the 100,000 mile mark. Fluids are the lifeblood of your vehicle. Over time, dirt and debris can begin to clog and overwhelm your engine, and its parts eventually leading to an expensive repair. In addition to this, many fluids have additives that lose their effectiveness over time. So it makes sense that replacing them with new and clean liquids will help to ensure that you can drive your car for another 100,000 miles. For most cars it is recommended that the oil, transmission fluid, coolant, power steering fluid, and brake fluid all get completely replaced. In some cases, certain fluids will reside in a permanently sealed reservoir for which replacement is not necessary or possible. Your vehicle's serpentine belts are made of a special kind of rubber designed to work within a hot engine compartment. However, this does not mean that they will last forever. When inspecting the belts look for signs of cracking, missing ribbing, marring, striping, general brittleness or uneven wear. If you see any of these signs it means that it is time to replace them with a fresh belt. 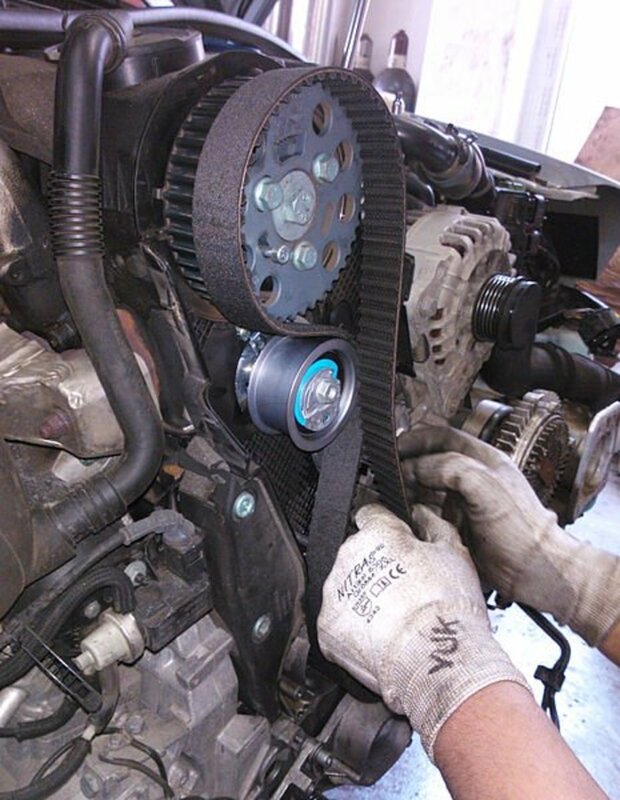 If your belt is wearing unevenly it may mean that a pulley or belt tensioner also needs to be replaced. The mighty wrench, a mechanic's best friend. Besides changing your oil, this maintenance task is probably one of the most important items that you can do at 100,000 miles because the damage caused by a broken timing belt on interference engines can be extremely costly to fix. 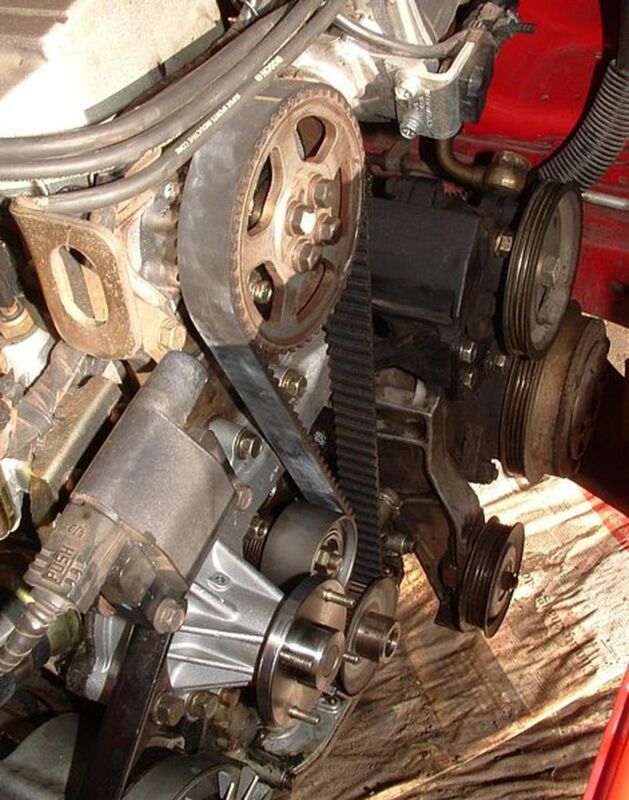 Statistically speaking, there is a really good chance that your timing belt will eventually break. This is especially the case if you regularly drive in really hot or really cold climates or where driving conditions are especially harsh. Even though this maintenance item is costly (both time wise and money wise), do not put off getting your timing belt replaced. And since you will be going to all of the trouble to have this replaced, you might as well have the mechanic replace the water pump too. In some cars, a new timing belt tensioner will also be required as part of this maintenance item. Since your vehicle's tires are the only thing that actually touches the pavement, it is vitally important to ensure that they are in good working order. Check the tire's inflation level as well as tread depth. Inspect them for signs of uneven wear, cracking, and bulging. Don't forget to rotate them either. If the tires have uneven wear, or the vehicle is pulling to one side, it may be time for an alignment too. When replacing tires it's always best to replace all four of them at the same time. If you can't afford four tires, it is okay to purchase two instead (either the front pair or rear pair). Furthermore, it is vitally important to choose high-quality tires designed for the environment that you drive in on your particular vehicle. Good tires will result in improved handling, acceleration, and braking while also optimizing fuel consumption. Along with tires, your brakes are another vitally important piece of equipment that requires maintenance. Check your pads and/or shoes to make sure that there is plenty of material left to keep you stopping in the future. If you have disc brakes, inspect the rotors for signs of uneven wear, pitting, or warping. If you see any of those items, it might be a good idea to have them turned. If you have to have your rotors turned or replaced you should also go ahead and replace the brake pads as well. Be sure to invest in high-quality brake pads as they will last significantly longer than cheap ones. In addition, high-quality pads (or shoes for that matter) will also help you stop your vehicle more quickly than cheap ones. Rust can destroy a vehicle over time. Check your car for rust and take care of it as soon as you can. In addition to belts and fluids, most auto manufacturers recommend replacing a few other items as well. For instance, changing out your spark plugs is a relatively easy task that should be part of the 100,000 mile maintenance. Don't be afraid to change the car's fuel filter, air filter, internal air filter, and PCV valve too. If your car is particularly old, it is probably time to replace the cap and rotor located on the distributor as well. While you are under your car changing the oil, you should inspect the undercarriage for signs of rust and other damage. 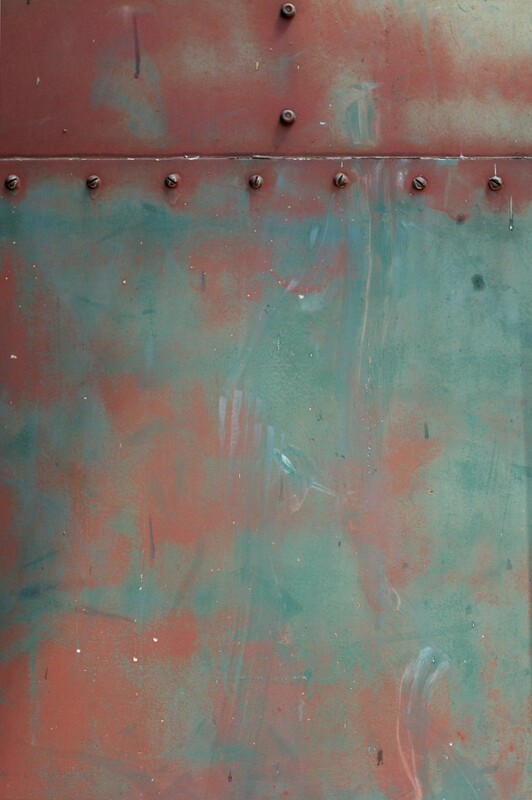 If there are signs of rust, hopefully you caught it early enough to get it taken care of properly. Another thing that you should do is to go ahead a lubricate all of the moving joints and hinges on your car. This includes things like the door and seat hinges. And finally, it is a good idea to inspect all of the rubber hoses located under your hood. This includes the coolant and oil lines as well as vacuum hoses and fuel lines. How Much Does the 100,000 Mile Maintenance Cost? Since the 100,000 mile maintenance is the largest and most in-depth of all of the maintenance intervals, it is also the most expensive. Still though, paying for maintenance will save you a lot of money and headaches in the long run. If you have an interference engine did you know that repairing one damaged from a broken timing belt could cost you upwards of $3,000 to repair? I have even heard of one case where the repair bill was over $5,000! Given that proposition, getting the maintenance will sound like a good deal. The chart below outlines the typical costs of many of the items that typically need to be maintained at the 100,000 mile mark. These are the usual cost ranges for each service and may differ depending on where you live and what products are used. My 2012 Honda Civic has just turned over at 100k. Should I be looking at changing the spark plugs or, does this vehicle have igniters? Also, will I need a valve adjustment or drive belt replacement? Most likely, the spark plugs need to be changed. The interval for changing spark plugs varies from every 30k miles to every 100k miles depending on many factors such as driving conditions, gasoline quality, and especially the type/quality of spark plugs that are in the vehicle. A valve adjustment is also likely needed as well if it has not been done previously. Drive belts may or may not need to be replaced depending on their condition. When my Honda Civic hit 100k miles, I changed the timing belt, water pump, serpentine belts, spark plugs, and adjusted the valves. This was 80,000 miles ago and I haven’t had any problems with the car since. I have a 2012 Honda Civic with 100,000 miles, and this year of Civic has a timing chain. Does this amount of miles on a car affect the water pump? What is the difference between serpentine and drive? If your vehicle has a timing chain then it is not likely that it will need to be changed. 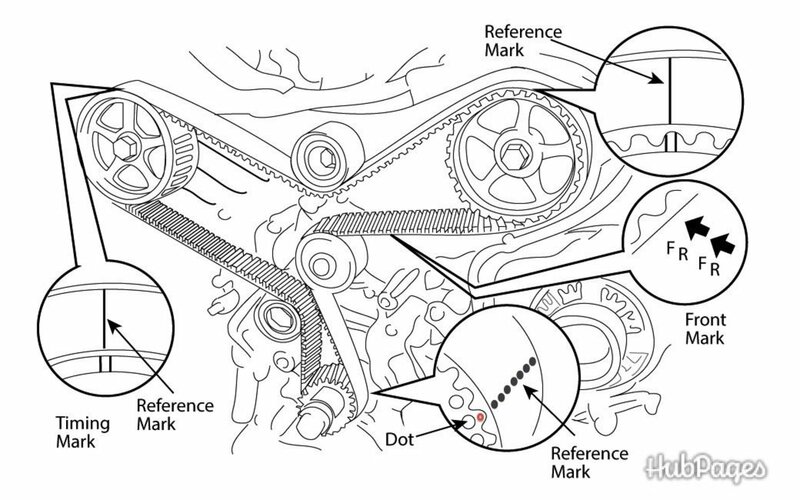 Timing chains can stretch and loosen over time, but for the most part they are designed to last for the life of the engine. On the other hand, a water pump can fail at any time. It is normally recommended to replace the water pump when the timing belt is changed because the procedures are essentially the same and there's a significant cost savings when replacing both at the same time. However, since the timing chain would not need to be replaced then the water pump should not be replaced unless there is a problem. The water pump is not a normal maintenance item that needs regular replacement, however I would check your vehicle's owner’s manual to be sure on what needs to be replaced when. The serpentine belts are the ones that drive the other components in the engine such as the power steering pump, air conditioner, and the alternator. These belts should be visible from the engine compartment. What does it mean when lights are dim on the dashboard? This usually means that there is low voltage in the battery. Either the battery is failing to hold a charge, or the car's alternator is not charging the battery correctly. I would recommend getting your battery tested to determine what the cause of the problem is. 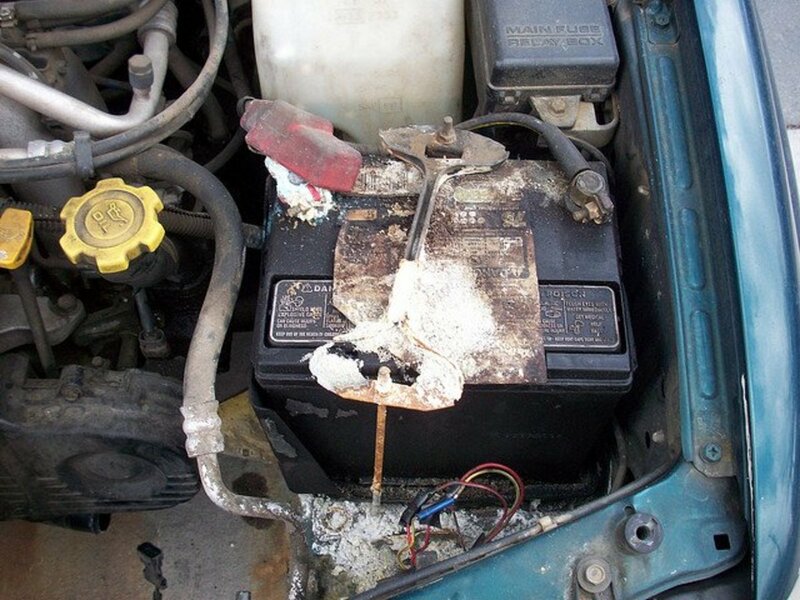 Also, if your battery is more than three to five years old, it may just simply need to be replaced. Should the engine mounts be replaced at a 100,000 maintenance? The engine mounts in most vehicles do not have to be replaced at regular intervals. In the right conditions, many engine mounts can last for the life of the car itself. In very hot or very cold climates or in harsh driving conditions they may not last very long. However, engine mounts should be inspected frequently and checked for major cracks or broken rubber. Use a flashlight and a small mirror if necessary to inspect all around the rubber mount. Symptoms of a broken engine mount include excessive engine vibration and a shifting or clunking of the engine itself when accelerating or braking. If you suspect that you have a broken engine mount it's important to replace it as soon as possible. In many cases it can be relatively easy to replace on your own. Should I check universal joints in my vehicle at 100,000 miles? Universal joints are used on most 4-wheel and rear wheel drive cars to transfer drive power from the transmission through the driveshaft to the differential. Primarily, U-joints should be inspected frequently, not just at the 100,000 mile mark. The main component of maintaining universal joints is to make sure that they are well lubricated and are functioning properly. However, a good number of u-joint assemblies are factory sealed and thus cannot be lubricated. If they are damaged or worn then it may be necessary to replace them. Inspection of the U-joint should include checking for leaking lubricant, rust, or excess wear or play which could manifest itself in a number of ways. This includes: 1) Squeaking that can be heard from under the car, usually when traveling less than 5mph, 2) A clunking noise that occurs when accelerating from a stop, or 3) High-frequency vibrations while driving. What about maintenance of struts on a vehicle? Struts and shocks are an item that doesn't necessarily have to be replaced at any particular interval. The wear and tear on a strut assembly is dependent on the type of vehicle you own and how/where it is driven. Many strut assemblies can last 5-10 years without any required repair or replacement given the right driving conditions. However, some car experts suggest replacing them at 100,000 anyways. In my experience this is not the case. A Mazda Protege I once owned needed the shocks replaced at less than 80,000 miles however the components on my Honda Civic lasted much longer. With significant variability based on driving conditions and vehicle make/model, struts and/or shocks should probably be inspected at every oil change. Look for wear on the strut itself or on the rubber components. Rust and corrosion can reduce performance of the suspension system. Also look for leaning or sagging in your vehicle and perform a bounce test to see if the struts respond properly. Push down as hard as you can on a corner of your vehicle. Once you let go if the car bounces a lot it may be time to replace the shocks and struts. If there is no (or limited) bounce, then your shocks and struts may be performing correctly. Should I overhaul or replace a manual transmission at 200,000km? A car is like a human body and needs regular check-ups. General auto maintenance will not only improve the performance and mileage of your car, it can also prevent your car from incurring serious damages that may require expensive repair jobs. My failed engine mount true story. Many moons ago when I first got my license and hadn't yet bought my first car I would drive my father's V8 Pontiac sedan. The mounts were completely shot and if you accelerated quickly the engine would twist opposite to the driveshaft rotation and lift up high on one side from a moment, which was just long enough for the mechanical accelerator linkage to hang up on a firewall bracket. When the engine fell back down the accelerator would be jammed full on and the only way to recover was to jam the column shift lever into neutral, which would somehow unhook the linkage at the same time. Not usually too much of a problem until I jackrabbited away from a left hand turn in front of traffic from three directions (I was 17 after all) and was suddenly doing unintentional donuts with cars swerving off the road all around me. I managed to haul the shifter into neutral and drive sheepishly away, but I learned the importance of fixing even things that don't prevent your car from going. Wow, 250,000 miles!? That's quite a feet - it's rare to see a car on the road these days with that many miles. Fortunately, Honda's are very reliable and if you've performed all the required maintenance up until this point you stand a good chance of driving even longer. Perhaps at this level of mileage it would be a good idea to do a really detailed inspection of the entire engine compartment. One thing I would really inspect well is the condition of the rubber parts under the hood - in particular the hoses and the motor mounts. These rubber implements tend to dry out after many years of use. If the radiator has never been replaced it may be time to do so as well. Your mechanic can check it and determine if it needs to be done or not. Other than that I would say just keep doing your regular maintenance and only replace major things when they break. My friend drove a Ford Focus that had a broken motor mount. The car had less than 150,000 miles on it. He ignored the issue and kept driving it. Eventually, around 8 months later, his alternator literally fell out of the car while driving on the freeway. There was also significant damage to some of the nearby electrical components and hoses. The excessive vibrations from the broken motor mount caused the bolts holding the alternator to the engine to loosen and eventually fall out. Having a 2nd 100k mile service done on my car (honda accord lx) since it hit the 250k mark this month! any recommendations for cars as old as mine? have a friend mechanic do all my work for me and he charges reduced rates since he closed his shop and works from home now :) wanna see if I am missing anything vital, would be nice to drive my car another 100k!! Thanks so much, this was a great source for me. I love my 15 year old Rav4 but have not really been looking after it. The car looked after itself! It has stood by me and I want to go give back by taking good care it it. Don't know how many years it has left but I can't bring myself to part with it. I have been figuring out how to start the process. The car has turned 150, 000k. Think it will go up to 200,000 and beyond. Eugene - Sorry that you had to experience the misfortune of a broken timing belt. Thanks for reading! Excellent HUB, I neglected to change the timing belt on my Corrolla and paid dearly for my mistake. Bent valves, damaged guides, broken rockers, damaged camshaft. Fortunately no piston was damaged or a con-rod through the block. I've learnt my lesson. Good tips, here in Japan it is rather rare for people to be still holding onto Car that long due to the increasing road taxes and maintenance cost. Most people will part exchange for a new car after around 5 years. But the car lovers will hang on to a loved car for longer and bear the high maintenance costs. Lanny - I know what you mean. It's a scam for sure. I change my oil every 5,000 miles. Why do you think that the oil manufacturers always state 3,000 miles to replace oil when it can last much longer? How does that compare with synthetic? Norm - Yes even the old and simple oil change is getting pricey. Today's high performance engines require higher quality oils and filters to maintain long term functionality. This, among other things, drives up the price. I do my own oil changes and I still spend upwards of $35 for 5 quarts of 0w-20 synthetic motor oil and a K&N filter. Lots of good information. Thank you. If you get tired of maintaining your old car, consider donating it to a charity. I use onlinecardonation.com to donate. They make everything incredible easy, picked up my donations, and sent me my receipts in the mail really quickly. Jack - Ill look into the prices and make an update if necessary. Thank you. A transmission fluid change is not $10-$25. its more like $30 for the fluid and another $30 for the gasket and filter. WOW, some one that knows how to take care of a car. My Grandfather, may he rest in peace, turned all of his Grand daughters into powder puff mechanics. Though you have written to do this with a car with 100,000 miles, my grandfather harped on us to change fluids and flush systems a lot more often and a lot sooner. I no longer can work on my own car and only one of my kids are mechanically incline, thus I have to trust my auto shop for all my maintenance but the advice you have given is words to live by. Thank you for sharing the words of the wise men. I agree with your points, and in fact, my car has 100,220 miles on it, and I just did about half of the things you mentioned. Always start with the most basic things, and progress forward to the more complex; your car will appreciate every little modification. Really well done...great read and a good starting point for high millage cars maintenance. Great hub! you did a bang-up job, very helpful articles and useful as well. keep posting, blessed! Timing Belt, Timing Belt Tensioner Pulley, Timing Belt Idler Pulley, CamShaft Seal, Crankshaft Seal, Power Steering Fluid & Belt, Spark Plugs, Spark Plug Wires, Refurb. Fuel Injectors, Fuel Filter, Engine Torque Rod, Front Motor Mount, Transmission Mount, Air Filter, PCV Valve, Sway Bar Links, Sway Bar Bushings, Suspension Struts w/new Mounts and Bellows, ball joints, resurfaced brake rotors, ceramic brake pads, flush brake fluid, synthetic transmission fluid, driver's side window motor and interior/exterior door handles, clean throttle body, clean idle air control valve, power wash engine compartment - Total cost of parts discounted: $800 Estimated cost if done at repair shop: $3,500 - $4,000. Mister "hardlymoving" is very right.As much as "Cwanamaker" listed,the other stuff mentioned by the "hardlymoving" will ear out.Combining few items to a lot of worned out parts,it couldt cost a lot to repair,specially by the front axle area,strouts,bearings,suspensions a lot of mechanics hate working in that area and the hit you hard in your pocket and also something to consider with olde vehicles no one carries your vehicle part,not even the dealer or sometimes very few horrible after market auto part companies out there,which you don't have much choice but to buy it off from them.Soemtimes walking to the junkyard and going through the headache looking for an original part,also auto part dismantlers know when a part becomes obsolete and more valuable in the market-they're going to hit you hard on your pocket. I love cars but I'm terrible with maintenance and repairs. This is great, helpful. I'm voting up! BEst, Matt D.
Entourage_007 - Not all cars have timing belts. Many cars, especially older ones, have a timing chain instead. The chain does not typically have to be replaced and they rarely break or have issues. I don't know much about BMWs, but based on car's specs I am pretty sure that your 2001 BMW has a timing chain and not a timing belt. Great article, do all cars have timing belts... I have heard that they are very expensive to replace.... I have a BMW - just wondering if it has a timing belt and if they need to be replaced as often as other cars. If it helps - my bmw is a 2001 with 97,000 miles - the engine is an inline 6 cylinder 3.0 liter. I have well over 100,000 on my Honda. I just had new spark plugs put in but I've been holding off on changing the timing belt. My 1998 4-cylinder has an interference engine (as is all prior to 2003), so I know I'm asking for trouble. Thanks for the reminder, and thanks for the suggestion to include the water pump when I have it done. I'm going to put priority on this now. Voted up and useful. My Honda Pilot crossed over the 130,000 mark last week. I bought it when it just went over 100,000 and I broke a piston on it right then, so I actually did all the work my self to replace the piston and 2 valves. The timing belt was already new on it so I assume it went through the 100,000 mile maintenance before me. Doing the "heart surgery" on my car my self was scary but now 30,000 miles later I am pretty confident that I did a good job as it's lasted this long. alanfish91 - I just finished the 100,000 mile maintenance on my Honda Civic. I did most of the work myself and only spent around 500 dollars. I feel great knowing that the maintenance is done. I feel confident and safe when driving the car because I know that it will last for years to come. Even though the maintenance was a little pricey, it was well worth it for my peace of mind. I agree with this hub! Haha. I am a mechanic, and I am frequently seeing people neglect their car's maintenance. I makes me sad. They often are concerned, with the cost of the work, but it's usually going to cost a lot more to repair or replace something than to just try to keep it working through care and maintenance. SallyTX - Thank you! I am planning on performing the 100k maintenance on my Honda this weekend and decided to turn my notes into a hub. hardlymoving - Yes there are a host of things that can fail at almost anytime. 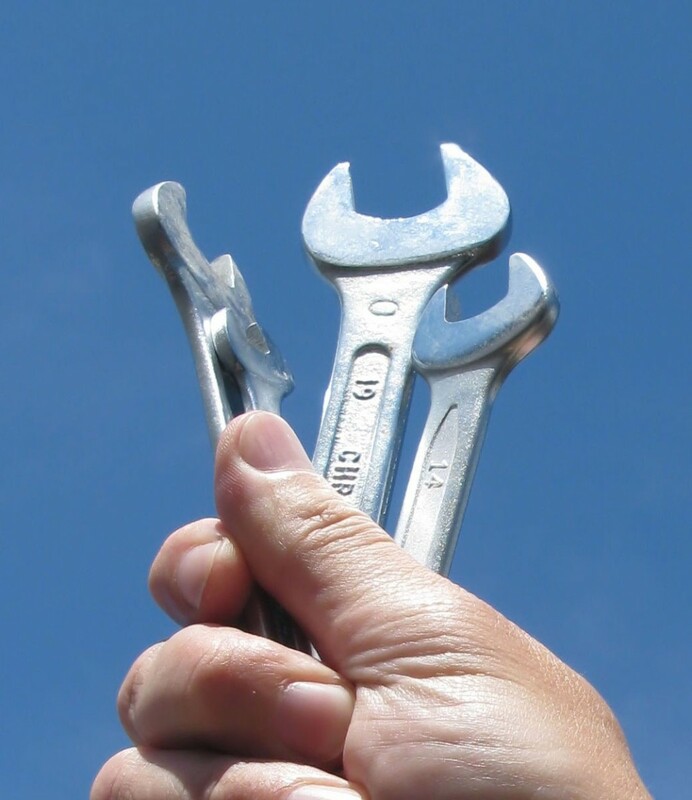 The only thing we can do as car owners is to do all of the preventative maintenance items when they are needed. Preventive maintenance will greatly reduce the likelihood that something (or anything for that matter) will fail. If properly maintained, most cars manufactured since the early 1990s should easily last longer than 200,000 miles. Pcunix - That is pretty amazing! I wish I could make mine last that long. Regardless of what you've mentioned, the other components that could fail include the: A/C compressor, starter motor, alternator, vacuum lines and air hoses, worn wheel bearings, brake rotors and master cylinder, cv axle shafts, tire rod ends, ball joints, suspension struts, dash bulbs, window regulators, clogged throttle body, sway bar links and bushings, etc. If the owner gets hit with 2 or more of any combination of these repair items in a matter of a few weeks, they usually start thinking about selling the car. Would you believe that we got new brakes for the first time at 91,000 miles? Yes, that astonished us and the dealership!